Articles and Features Reading List Shakespeare's Grammar Speech Analysis Other Links Ask the Bard! The sketch at left is perhaps one of the most important in theatrical history. In 1596, a Dutch student by the name of Johannes de Witt attended a play in London at the Swan Theatre. While there, de Witt made a drawing of the theatre's interior. A friend, Arend van Buchell, copied this drawingvan Buchell's copy is the sketch rendered hereand in doing so contributed greatly to posterity. 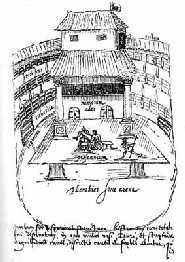 The sketch is the only surviving contemporary rendering of the interior of an Elizabethan-era public theatre. As such, it's the closest thing historians have to an original picture of what the Globe may have looked like in its heyday. Shakespeare's company erected the storied Globe Theatre circa 1599 in London's Bankside district. It was one of four major theatres in the area, along with the Swan, the Rose, and the Hope. The open-air, polygonal amphitheater rose three stories high with a diameter of approximately 100 feet, holding a seating capacity of up to 3,000 spectators. The rectangular stage platform on which the plays were performed was nearly 43 feet wide and 28 feet deep. This staging area probably housed trap doors in its flooring and primitive rigging overhead for various stage effects. The story of the original Globe's construction might be worthy of a Shakespearean play of its own. The Lord Chamberlain's Men had been performing in the Theatre, built by James Burbage (the father of Richard Burbage) in 1576. In 1597, although the company technically owned the Theatre, their lease on the land on which it stood expired. Their landlord, Giles Allen, desired to tear the Theatre down. This led the company to purchase property at Blackfriars in Upper Frater Hall, which they bought for £600 and set about converting for theatrical use. Unfortunately, their aristocratic neighbors complained to the Privy Council about the plans for Blackfriars. Cuthbert Burbage tried to renegotiate the Theatre lease with Giles Allen in autumn of 1598; Allen vowed to put the wood and timber of the building "to better use." Richard and Cuthbert learned of his plans and set in motion a plot of their own. It seems that the company's lease had contained a provision allowing them to dismantle the building themselves. In late December of 1598, Allen left London for the countryside. The Burbage brothers, their chief carpenter, and a party of workmen assembled at the Theatre on the night of December 28. The men stripped the Theatre down to its foundation, moved the materials across the Thames to Bankside, and proceeded to use them in constructing the Globe. The endeavor was not without controversy. A furious Giles Allen later sued Peter Street, the Burbage's carpenter, for £800 in damages. The courts found in favor of the Lord Chamberlain's Men and ordered Allen to desist from any further legal wrangling. The Globe would play host to some of Shakespeare's greatest works over the next decade. In an ironic epilogue, the troupe won the right in 1609 to produce plays at Blackfriars, and subsequently split time between there and the Globe. In 1613, the original Globe Theatre burned to the ground when a cannon shot during a performance of Henry VIII ignited the thatched roof of the gallery. The company completed a new Globe on the foundations of its predecessor before Shakespeare's death. It continued operating until 1642, when the Puritans closed it down (and all the other theatres, as well as any place, for that matter, where people might be entertained). Puritans razed the building two years later in 1644 to build tenements upon the premises. The Globe would remain a ghost for the next 352 years. The foundations of the Globe were rediscovered in 1989, rekindling interest in a fitful attempt to erect a modern version of the amphitheater. Led by the vision of the late Sam Wanamaker, workers began construction in 1993 on the new theatre near the site of the original. The latest Globe Theatre was completed in 1996; Queen Elizabeth II officially opened the theatre on June 12, 1997 with a production of Henry V. The Globe is as faithful a reproduction as possible to the Elizabethan model, seating 1,500 people between the galleries and the "groundlings." In its initial 1997 season, the theatre attracted 210,000 patrons. From the Bartleby.com website. This is the entry on the Globe Theatre; it also provides information on other theatres of the time, such as The Rose and The Blackfriars. 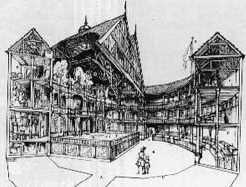 An overview of Elizabethan theatre presented by TheatreHistory.com. Reprinted from Bellinger's A Short History of the Theatre (1927). This is the official Globe Theatre site. Rosalind Tedford is a liaison between Wake Forest University and the Globe Theatre. There are some great shots of the Globe here. Explore Shakespeare's Globe Theater with this detailed discussion of the most famous venue in English literature. The Cal Berkeley Shakespeare Program provides a survey of resources involving Shakespeare's stage and Shakespearean performance, both during his lifetime and through its subsequent development. This Cummings Study Guides page dedicated to Shakespeare's Globe presents a good overview on the theater and related topics. A site that did quite well in presenting the modern reconstruction of the Globe. SGC US is now shut down, but the site remains live as an archive of its work. Another useful overview of the Globe Theatre. An animated imagined tour of the Elizabethan-era Globe courtesy of the University of Cambridge.